Eagles players are grappling for answers after opening the season with two losses. Is it a lack of focus and effort, or is Chip Kelly’s roster upheaval already haunting the franchise? PHILADELPHIA — Sam Bradford was the first one off the field. A cluster of the fans who stuck out this ogre of a game were waiting above the Eagles’ tunnel to shower the home team with boos as the players retreated to the locker room. There is panic in Philadelphia, where a 20-10 loss to the rival Cowboys dropped the Eagles’ record to 0-2. 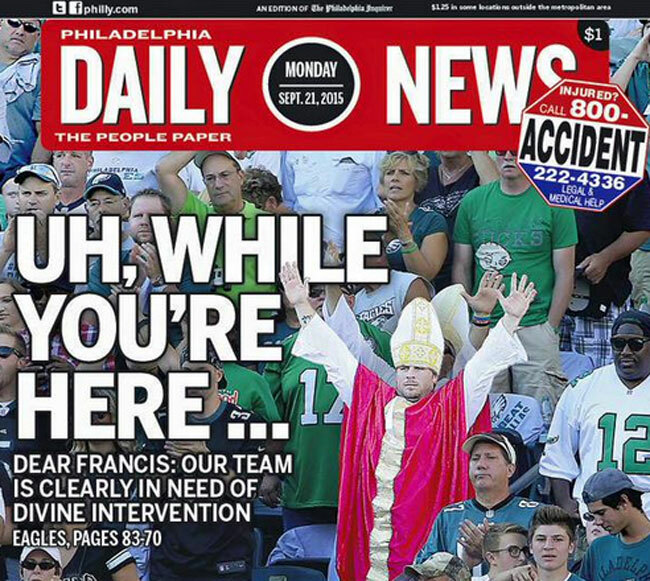 Look no further than Monday’s cover of the Daily News, which issued a plea to Pope Francis for some divine intervention when he visits next week. After Kelly’s overhaul of the roster, starting with the Sam Bradford-for-Nick Foles swap, there was going to be no middle ground—especially after Kelly failed to take the Eagles past the wild-card round in either of his first two seasons. He remade this franchise in a vision that only he saw clearly, setting himself up to be deemed either a genius or a fraud. Two games of an NFL season aren’t enough to deem anyone anything, but the early results aren’t favorable. Every year at this time, the list of 0-2 teams that have made the playoffs reemerges (24 have done it since 1990). But more important than statistics is film, and the film of the 0-2 Eagles shows an offense that has been impotent for three of the four halves of football it has played this season. In place of the fast-paced juggernaut that Kelly built his reputation on, we witnessed an offense that didn’t make a single first down in the first half (save for one via a penalty). By the start of the fourth quarter, the unit had neither scored nor gained 100 yards of total offense. There are still questions about the Eagles’ defense, but it was the offense’s stunning ineptitude on Sunday that left not just observers but the players as well baffled. “We’re in a daze right now,” said right tackle Lane Johnson, who sat at his locker at Lincoln Financial Field in full uniform through rounds and rounds of interviews, as if maybe being asked more questions would help him come up with new answers. The answer may be both. The offensive linemen were the first to admit that their play against the Cowboys was, as center Jason Kelce put it, “consistently bad.” Last year’s NFL rushing king, DeMarco Murray, was tackled for loss on five straight runs between the first quarter and the third quarter. Each time, he was stopped by a defender who was either left unblocked or had no trouble shedding his blocker. Murray’s final rushing line: 13 carries, two yards, bringing his total for the season to 11 rushing yards. Afterward, players reiterated that they knew the Cowboys would play an aggressive, downhill style of defense; they knew Dallas would be using stunts and twists after the snap on both run and pass plays. But Philadelphia couldn’t stop the penetration, and you have to wonder how much of it was the scheme. On two of Murray’s negative runs in the third quarter—one for a loss of six yards and the other for a loss of five—the Eagles pulled both the center and a guard. That’s an odd choice against an aggressive defense, because it opened lanes for defenders to shoot through. That’s a strange thing to hear, given that Kelly’s offenses are based on the concept of dictating the action to the opponent, not the other way around. In the rare cases on Sunday when the Eagles’ drives lasted longer than four plays—they had only three such drives—they weren’t dictating even the pace of the game, a departure from the breakneck speed that is a Kelly hallmark. The most obvious explanation is that there simply wasn’t enough time in the offseason for all the new pieces of this offense to coalesce together. The practice restrictions in the CBA limit on-field work in the offseason and training camp, and Bradford didn’t participate in 11-on-11 drills until August, as he continued to rehab from ACL surgery. The Eagles lost reliable receiver Jeremy Maclin in free agency and are breaking in a rookie at the position, Nelson Agholor. They shipped all-time franchise rushing leader LeSean McCoy to Buffalo, and signed Murray, whose north-south running style was presumably a better fit for Kelly’s offense. So far it hasn’t mattered who is in the backfield, raising questions about another element of the roster slicing and dicing: Under Kelly’s direction, the Eagles cut both of their veteran starting guards, Evan Mathis and Todd Herremans. Their replacements, Allen Barbre and Andrew Gardner, are journeymen who have only a smattering of spot starts on their résumés. Three times in his post-game press conference on Sunday, Kelly made a crack about skill-position players having nothing to do with not blocking a three-technique defensive lineman. Generally, guards have something to do with blocking a three-technique defensive lineman. Bradford was the centerpiece of Kelly’s roster overhaul, but he hasn’t looked the part. He hasn’t played quickly or decisively. A few times he stumbled while dropping back on Sunday. There were plenty of moments when you wondered, What is he doing? Testing the lack-of-time-to-coalesce theory in the Eagles’ locker room was a dicey proposition. “I don’t know,” said Kelce, who then paused for four full seconds. “I don’t want to say that.” Said Johnson, “I think that’s an issue, but we can’t use that as an excuse.” Agreeing with that notion, of course, would call into question the master plan—was it a bad idea for their coach to make such extreme changes? Players cycle in and out constantly in college, but can that work in the NFL when the talent level across all 32 teams leaves little margin for error, and no grace period to work out the kinks? In the business of the NFL, being overconfident and not trying hard enough aren’t things to which players readily admit. But these were some of the theories being floated in the home locker room Sunday evening. The suggestion of a lack of effort came from Agholor, an earnest rookie who seemed to take Kelly’s post-game locker room talk about bouncing back very seriously. Bradford was the centerpiece of Kelly’s roster overhaul, but he hasn’t looked the part. He hasn’t played quickly or decisively. A few times he stumbled while dropping back on Sunday. He wasn’t helped by the line’s struggles to pick up the Cowboys’ stunts, or by the five dropped passes by his receivers, three on third-down plays. But there were plenty of moments when you wondered, What is he doing? Like when he targeted Zach Ertz in the end zone, despite the fact that Ertz was blanketed by linebacker Sean Lee, who snatched an interception. Or the pass in the fourth quarter that sailed way over the head of a wide-open Agholor, landing five yards behind him. Part of Kelly’s makeover has been literal—there’s a new paint job in the home-team tunnel, and a new garish neon sign with a very Kelly-esque mantra: Habits Reflect the Mission. Do the Eagles need new habits, or a new mission? Maybe both. What about all the changes that have been made? Does he wonder if they were all for naught?